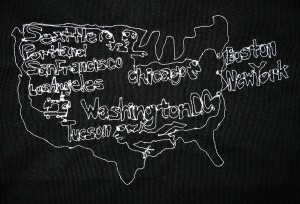 Last week I posted about Paul Nosa’s Sewing Tour project on Kickstarter. Paul is an artist based in Tuscon, AZ who is planning to travel across the country with his solar and bike powered sewing machine. I posted about the project because the video is awesome (check out the video here) AND he is bringing the tour to Pittsburgh. The first Kickstarter project didn’t reach funding – but he has relaunched the project on Kickstarter here. A few changes to the route – his first stop is Pittsburgh! Check out his video update here.